Neatly manicured window boxes along Waynesville’s Church Street greet diners entering Frogs Leap Public House, but once inside, the aroma from the wood grill transports guests to autumn bonfires and brings to mind hearty, cool-weather fare. 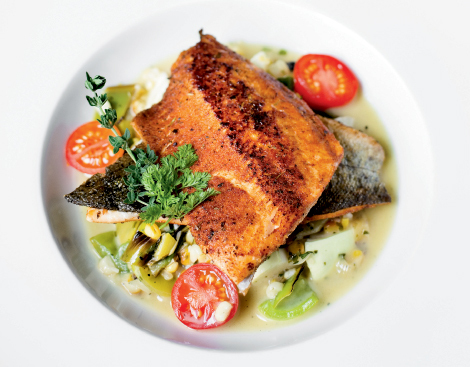 Owned by Toni and Kaighn Raymond, who left the Atlanta culinary scene for the mountains, Frogs Leap is, at first glance, a down-home smokehouse with specials that read like elegant versions of traditional meat-and-three plates. But Frogs Leap is also what one might consider a formal gastro pub, that takes pride in butchering the meats, grinding beef and pork for sausages, and curing bacon and tasso ham. The jams, preserves, and pickles are also house-made specialties in season. In the dining room, nature photography and vintage kitchen accessories accent the dark wood paneling. A separate room with a log-topped bar beckons with superior cocktails created with house-invented syrups, infusions, and garnishes, and a sipping list that includes single malt scotches, bourbons, rye, brandy, and ports. Beers and a smart selection of wines fill glasses as well. My companion and I settle at a table with a view of the open kitchen and observe the chefs tending three fires: a custom-built pizza oven, a fireplace where chefs flame fresh wood into charcoal, and an Argentine wood grill. “Nothing tastes as much like WNC as natural local meats and vegetables cooked on local wood fires,” says Kaighn, who mixes indigenous hardwoods such as hickory, oak, cherry, peach, and apple with Argentinean wood. Fried okra served in paper cones with piquant buttermilk-Tabasco dipping sauce begins our meal. The signature appetizer, Devils on Horseback, bacon-wrapped roasted medjool dates stuffed with smoked blue cheese and spiced local honey, was a rich indulgence. A goat cheese and pine nut stuffed chicken breast was accented with savory tomato ratatouille and set in a delightfully light celery root and potato puree. Also highly seasoned was the blackened Sunburst Farms trout with black cherry tomato, bacon, and grilled leek-lemon thyme broth. The most refined dish proved to be the ravioli featuring soft pockets of airy ricotta topped with a phalanx of shiitake and wild mushrooms in a light garlic cream sauce. It was a touch of the world influence Kaighn brings to an otherwise hometown spot loyal to local flavors.